Is 2015 When the U.S. Stock Market Bubble Pops? Home » Is 2015 when the stock market bubble bursts? Is 2015 when the stock market bubble bursts? The stock market has recently hit record highs, so the economy must be doing great… right? Contrary to what the media and politicians would have you believe, we are witnessing one of the biggest bubbles in human history, and there are signs that it may be near its final breath. The central planners are running out of band-aid solutions and people are beginning to notice. The markets that have been artificially inflated through the Fed’s lax monetary policies in recent years are about to fundamentally change. The one asset class that has benefited the most from central bank driven stimulus since 2008 is the U.S. stock market, which has climbed from its low of 6,443.27 (on the Dow) on March 6, 2009 to breaking above the 18,000 barrier for the first time ever this past December 23. In the first two weeks of 2015, however, we are seeing the stock market move lower. And with no fundamental recovery in sight, one can only ask how long before the game is up and reality sets in. Sure, we may see the market perform a bounce from here or even inflate to new highs as companies buy back their own stock at a record pace, as reported recently by Forbes. Ultimately, however, things that can’t go on forever don’t. The U.S. stock market is trading at extremely low volumes. For example, take a look at the Dow Jones Industrial Average. Since the market bottomed in late 2008, we have seen the speculative money move in, which has fueled the markets higher. But at the same time, active investors are increasingly pulling out of the market. With such low volumes at present, it won’t take much selling to trigger a flash crash in the market. While establishment groups like the Plunge Protection Team would step in to prop up the market if the market begins to falter rapidly, they can only keep up the confidence game for so long before the free market overwhelms the manipulators – as it always does in the long term. Another major factor leaning to an overvalued stock market is that price to earnings ratios are at all-time highs, meaning companies are overvalued given their earnings. 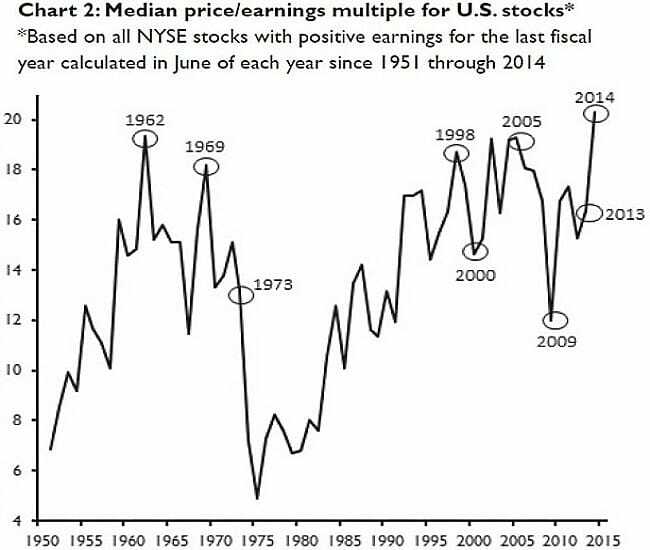 As Jim Paulsen noted in a letter to Wells Capital clients, “the market is about as overvalued as ever, based on numerous criteria but mostly due to the median (not average) P/E multiple surging to fresh all-time highs”. In the chart below, it’s clear how from the end of 2014, we have reached a peak. If history and fundamental analysis is anything to go by, we are set for a major correction soon. It’s little wonder why so many leading economists like Marc Faber are saying that now is the time to pull out of the stock market. “We simply have highly inflated asset markets. Real estate is high, stocks are high, bonds are high, art prices are high, and interest rates and short-term deposits are basically zero,” Faber said. “The only sector that I think is very inexpensive is precious metals, and in particularly precious-metals stocks.” Faber went on to single out U.S. stocks as especially overvalued. As Faber and many other leading economists are forecasting, 2015 is the year the stock market runs out of steam and precious metals take off. If you haven’t already put at least some of your savings into gold and silver, there may be no better time than today to start. If stocks do indeed crash – whether it’s tomorrow or in six months – it’s better to be a few months early than a day late. Give us a call today, or click here to get your FREE Info Kit on how you can safeguard your savings with precious metals. 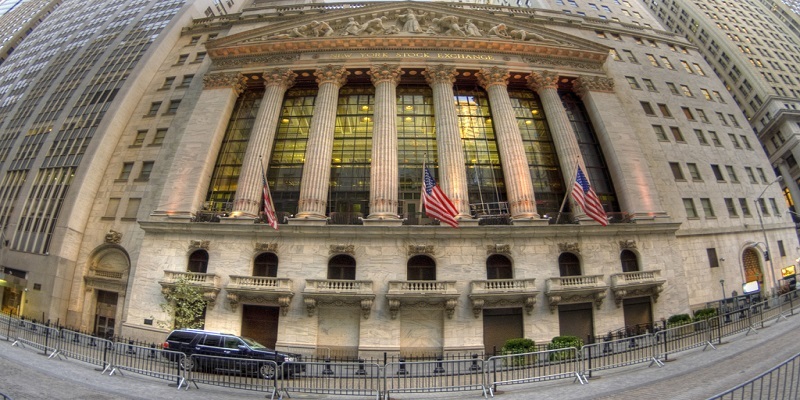 Get even more news on stocks and the economy – follow us here on Google+.